It`s the end of green tea week~ I hope you enjoyed the first two recipes! 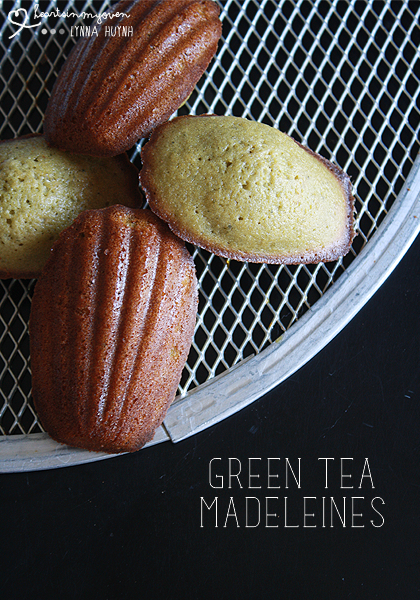 I`m going to end it with these awesome and yummy green tea madeleines! 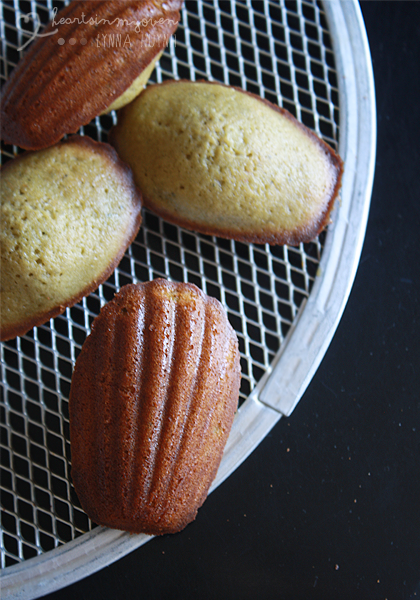 I loved the madeleines my parents bought me when I was a little from the Vietnam grocery stores. I always assumed they were the same as the original French madeleines since France took over Vietnam back then. But, I`m not here to give you a history lesson! The Vietnamese ones are less sweet and spongier. I didn`t even know there was a difference until I tried one from Trader Joe`s. The ones at TJ`s were harder and much sweeter. Since I didn`t have a recipe for the Vietnamese version, I decided to use a recipe I saw from Patricia`s wonderful blog, Technicolor Kitchen and made them green tea instead! My mom reallyyyy liked them. I think I might make some for her birthday. ;) These are great since I don`t like the ones from the grocery stores because those are just way too sweet. Since I love green tea desserts, these were perfect for me. It`s definitely a recipe I will revisit! 1. Spray madeleine molds with oil, or butter and flour it. Set aside. 2. In the large bowl, whisk the flour, baking powder, salt, and green tea powder. 3. In bowl of your electric mixer, mix together the sugar and eggs until it becomes light colored and pale (it'll take about 2-3 minutes on medium high speed). 4. Add the vanilla into bowl with the sugar and eggs. Mix. 5. Using the rubber spatula, fold into the dry ingredients (flour, baking powder, etc). 6. Mix in melted butter until combined. 7. Using a cookie scoop, scoop batter evenly into molds. 8. Cover the entire pan with saran wrap (wrap should touch the batter). 9. Refrigerate the batter for at least 3 hours, for up to 2 days. 10. Preheat your oven to 400°F when you're ready to bake. 11. Bake for 7-10 minutes. Remove the madelines and let them cool on a cooling rack. She really does! :) I hope you enjoy them! These look wonderful. 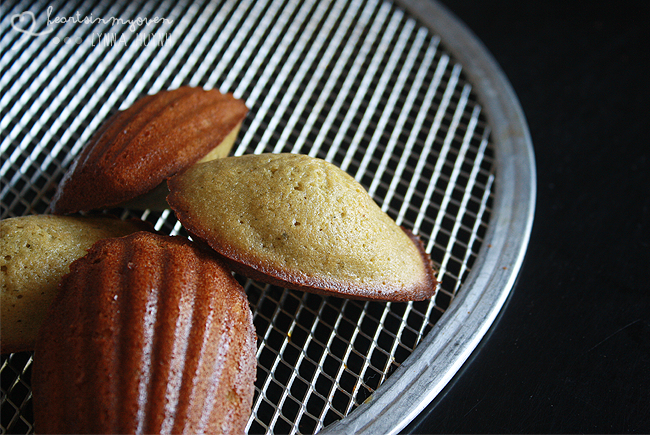 I need to buy the special pan to make them..
What a creative way to enjoy madeleines! Yay! You should definitely try some! They really soft and moist! these look delicious, i love all of the green tea recipes!